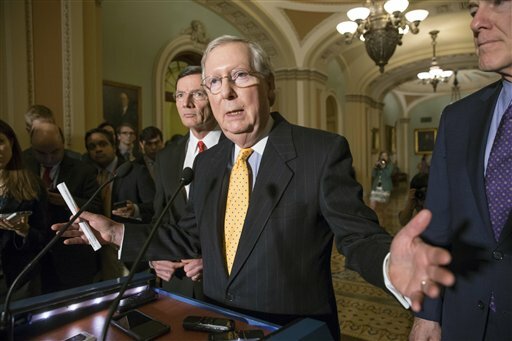 Senate Majority Leader Mitch McConnell, R-Ky., flanked by Sen. John Barrasso, R-Wyo., left, and Majority Whip John Cornyn, R-Texas, right, talks to reporters following a closed-door policy meeting at the Capitol in Washington, Tuesday, March 15, 2016. As predicted, the media obsession with one sentence from one presidential candidate continues, but it’s interesting to dig deeper into some of the reactions to Democrat Hillary Clinton’s comments about her plans for helping the nation’s struggling coal communities (by the way, I’ve posted Secretary Clinton’s letter to Sen. Joe Manchin here). … When President Obama was a candidate, he boasted that his energy tax policies would make electricity prices skyrocket for American families. When President Obama took office, his administration declared a war on coal families and on their jobs. For a time, his administration tried to deny it was declaring war on anyone, but now we hear boasting from the highest ranks of the Democratic Party that these policies are going to put coal miners out of business Miners in Kentucky and across the country know that coal keeps the lights on and puts food on the table. What they want is to provide for their families. But here is how more Democrats seem to view these hard-working Americans and their families: just statistics, just the cost of doing business, just obstacles to their ideology. This is callous, it is wrong, and it underlines the need to stand up for hard-working, middle-class coal families. That is what I have done here in the Senate. That is what I will continue to do. I hope our colleagues will join me. I understand the Republican leader’s concern about coal not being the way it was. It is simply that the American people have made a decision that we are going to have to look for another way to produce energy. There is still a place for coal in our society, but everyone has to acknowledge that it is not as it was a few years ago. I wish the Republican leader cared more about moving to help the pensions of these coal miners. They are desperately looking for support. We support them on this side. All the coal miners support it. We can get no support from the Republicans. We tried during the work we did at the end of the year. We came close, but Republicans said no. I want all those coal miners from Kentucky and around the country to understand that we are trying to help them with their pensions, but unless we get some help from the Republicans, there will be no support. That is too bad. We are trying. We are trying. We are trying. A 4 second sentence does not define a policy or a speech. As always, pundits are seeking an opening to totally twist the truth.